Unlike in previous seasons, this year we found ourselves ready to race before the first round of the LMA Euro Saloons, so when we saw that Motor Sport Vision Racing (MSVR) were planning an Open Saloon race at Brands Hatch, it seemd a good idea. We planned to do some form of testing just to check that the winter work had been a success, but a non-championship race seemed that much more attractive way to check out the kappa - more so when MSVR dropped the price down to £100. A quick call to MSVR confirmed that although the kappa didn't really fit into their class structure, they would be more than happy for us to race. We were placed in Class A, planned for four wheel drive cars up to 3000cc (non-turbo). The main focus over winter had involved straightening out the front end, fitting new wings and bonnet, while Ian at Alpha Composites was locked in our garage for a week to make a more "Pongo" friendly front bumper. Following a steer from Tony Soper, we acquired the gearbox from an Alfa Romeo 156 2.5 V6 off eBay with the intention of swapping over the diff to give us a more race friendly top speed of around 150mph in 6th, rather than last year's theorectical top speed of 190mph. But when looking at the internal parts, Auto Integrale found it wasn't as simple as that and ended up swapping the complete gearbox internals. This proved to be a blessing as the Alfa gearing is more evenly spaced, especially between 4th/5th/6th gears. We had also aimed to capitalise on turbo torque, so once again the kappa was despatched to Owen Developments with a brief of setting up to boost around 1.5 bar in the midrange, tailing off to around 1.2 bar as we know the engine can't flow any more at higher revs. And being the kappa. of course this didn't go to plan. The turbo did not want to spool up as it had done last year, overall power was still there (399bhp @ 6500rpm) but torque was a "paltry" 328 lb.ft now at the heady heights of 6000rpm. Just the exact opposite of what we were aiming for. The turbo was removed and checked but nothing obvious was wrong. Only thing left was to change the air filter to a larger, less restrictive one and see how we fared at Brands Hatch. And so to Brands Hatch on a bitterly cold March morning - will someone please tell the weatherman that we're supposed to be in Spring now? It was good to see some fellow LMA Euro Saloons drivers also taking advantage of some cheap pre-season race/testing. 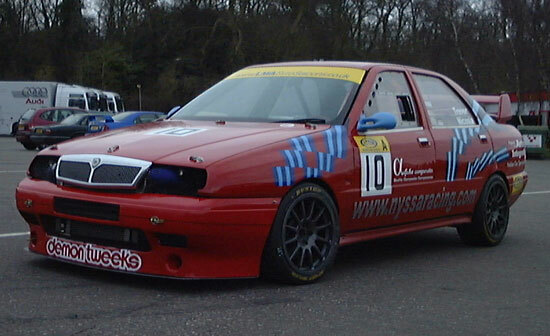 Peter Challis had brought along the Nissan Primera (so goodbye any thoughts of race glory for us), and Kieran Fribbens and Michael Collins had brought along their Ford Fiesta 1800 and Vauxhall Astra GTE for a run out. The cheap price had attracted a full 32 car grid as varied as any we see with the LMA Euro Saloons championship. Scrutineering was a slow process, probably because of the need to check for in-date harnesses, plumbed in fire-extinguishers and Snell 2005 approved helmets. We were confident we'd done all that was required for the kappa, but you always get nervous at these times. We got a clean bill of health, Peter Challis wasn't so lucky - the harness on the Nissan had "expired". No matter how much you promise this year will be different, first race of the season always just comes too soon, and the organisation is no better year on year. And so it was this time. MSVR were running a tight ship and the call to qualifying after a slow scrutineering session caught me by surprise. So much so that as I drove through the tunnel to the infield, I realised my scrutineering ticket was inside my pocket. Better than being back in the Paddock I guess, but not as good as being displayed on the window! Luckily there was an old scrutineering ticket there so I was able to swap them over without drama. I set the camera to start recording just in time as the first cars were sent down the pitlane. Back into the driver's seat and do up the harness, only where is the bit all the straps clip into? Not here! Scrutineering were so busy checking the harness was still in date, they missed the buckle not being there. Or so it seemed, I got out of the car and found it was under the seat, so had to pull it back through the seat, buckle up, put on lid and gloves - and all the while trying not to rush! Lucky for me the cars were just lining up in the pitlane ready to go out on track. A couple of minutes later and the season started for real as we went out on track. A slow first lap in an attempt to warm the tyres was followed by speeding up and soon I started passing cars. I'd already seen a couple of spinners by lap 3 when it was my turn. The back stepped out round Clearways and the kappa did a graceful 180. Once I knew I wasn't catching it, I dumped the clutch so once I stopped, it was just a matter of letting the five cars I had just overtaken all go past before turning round across the track and getting back on with it. Peter Challis had been unable to partake in qualifying, I didn't really have much idea of who else would be quick. A Golf R32 had gone past me early on but didn't look that quick - no-one else passed me during the session. Normally this would have filled me with confidence, but I had also spent a few too many laps being harrassed by Michael Collin's Astra GTE. I knew from past experience this was a 59 second car so figured I wasn't doing much better - the kappa has been round in the 56s and should be capable of a lot better than that. I was right, Michael had dropped into the 58s and in fact had out-qualified me by 7/1000ths of a second. That was the gauntlet well and truly thrown. I was a little disappointed to be as far back as 9th, but knew I'd not been driving that quickly. There was little grip on the cold track, my rear tyres came in stone cold, the fronts barely lukewarm. I was sure we could do better in the race. Ninth on the grid, at least an inside line into Paddock, but also where it gets more crowded. As the lights went out, I pulled away in the usual flurry of wheelspin but looked to be reasonably holding my own into Paddock with just one or two places lost. Not a problem, can soon make them back up on the rise to Druids - or so I thought. As soon as I hit the throttle, the kappa misfired. No, make that a giant stutter, just wouldn't pull cleanly. Needless to say this allowed other people to come past. A pattern of the first three laps was the kappa would stutter, people would go past and then the kappa would find some performance and take a place back temporarily. Apparently I dropped back to 18th position as Kieran Fribbens came round the inside of me at Druids on the 4th lap - and then all of a sudden the stuttering stopped! By the Esses I had repassed Kieran and set about making up a few places. The first few were simple enough, even an off song kappa had more than enough horsepower to blitz the slower cars down any of the short straights - and off song it definitely was. Even now running cleanly, at least 100bhp must have stayed at home in the warm rather than come out to play. This wasn't the end of the world, we were viewing the day as a test session with a competitive edge, so although a lack of power was going to affect our race, the important thing was that we were out and running. Better find the problems now when they don't cost us points. There was some positive - the kappa seemed to be handling fine and as the race went on, the understeer that plagued us at Clearways last year didn't manifest. Maybe the different suspension settings, maybe the 2005 spec tyres? Also a plus point was the gearing. Druids was now a third gear corner, as was Graham Hill - and although the turbo was only running at 0.9 bar at best, I had as good a throttle response leaving these bends as any of the normally aspirated cars - last year as the kappa went off boost, or spun the front wheels to oblivion, cars would tend to pull away before I could haul them back in again. I was moving nicely back through the field until I came up behind Eric Falce in his Fiesta and Steve Govett's Toyota Avensis. Eric was having a rare old battle trying to get past Steve. I'm not sure what Steve's car was, it looked all fibreglass with a hint of Avensis and was 3 litre engined and rear wheel drive. It was also smoking badly, spraying out a lot of oil as I was to find later. The kappa had been revving out freely since the stuttering had stopped, but now it wasn't revving quite so well, no longer clearing 7000rpm in 4th easily down the straight before slotting into 5th. So a couple of laps of trying to get past both cars came to nothing, Eric having a regular attempt on Steve too. Finally Steve went just wide enough out of Graham Hill for Eric to swerve left to avoid him, just as I was planning to go through - but still Steve made the Esses first. Eric sold Steve a dummy coming into Paddock as we were almost three abreast and shot down the inside on the run to Druids finally making the pass stick, leaving me to chase Steve on my own. For EIGHT laps! Didn't matter what I tried, there was just not enough power left to go past the Toyota down the straight, and Steve was defending everywhere else staunchly. Finally on lap 18, Steve spun at Clearways trying to pass a backmarker and I was free. Only being free wasn't so great as the next car up front was a good 10 seconds clear and it was plain I wasn't catching anyone else. The kappa felt like it was progressively getting that little bit slower lap by lap. With two laps to go, all hell broke loose at the Esses. A giant oil spill all through the Esses and Clearways claimed about three cars at once, just as I was coming down the back straight. The marshalls were waving the stripey flag big-time, I was able to slow right down and tip-toe round avoiding any falling-off scenario myself. The following lap was the final lap and although the cars in 3d and 4th lapped me during that lap, I just went round conservatively to make sure of the finish. Winding down with no idea of where I had finished - the positions display on the gantry by the start-finish line was off - I was pleased and surprised to be directed back down the pitlane rather than into the assembley area to return to the Paddock. Clearly a pot was coming my way! I was guided to the podium along with the other pot winners and awarded first in class A, the medal being presented by Jonathan Palmer himself. Peter Challis had been allowed to start the race from the back having located a harness to use and fought his way through the pack to win the race. After he and the other class winners had been interviewed, it was my turn - a first for me to have to talk to the crowd! There should have been another race, in fact there was another race that afternoon for most drivers. But after much deliberation, I decided there was little point in going out again. I had learned the gearbox and suspension are fine, but that the engine wasn't running right. Going out again would tell me nothing I didn't already know, but as I had no understanding of what the problem might be, then I might easily cause more damage and not then be ready for Snetterton in three weeks time. The kappa is due to return to Auto Integrale later this week in an attempt to diagnose the problem. I suspect its going to be break down of one or more coil packs (again), really must go and buy a brand new set. Next outing is planned to be with the Lancia Motor Club at Goodwood on 1 April. At least this year we've proven the kappa runs reasonably, so will hopefully avoid any repeat of last year's pyrotechnics. And hopefully we will have all 400bhp reporting for duty so we can try her out for real in preparation for the following week's season opener at Snetterton.